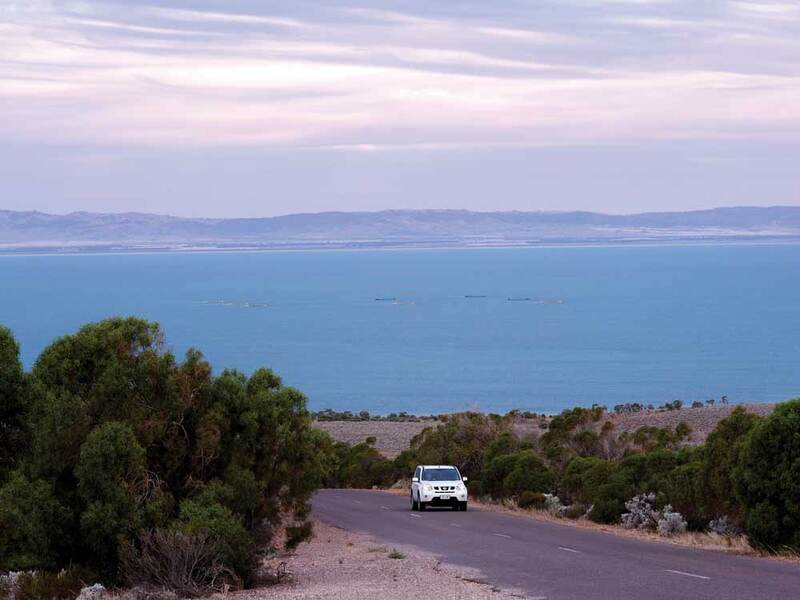 Whyalla is located on one of Australia’s most picturesque stretches of coastline, where the rich red colours of the Australian outback meet the turquoise sea of the Spencer Gulf on South Australia’s Eyre Peninsula. Growing up around BHP’s iron ore jetty, Whyalla was declared a city in 1961, as the company’s industrial activities grew alongside the building of shipyards and steelworks. Whyalla still has a substantial industrial base, providing mining, engineering and steel manufacturing services. 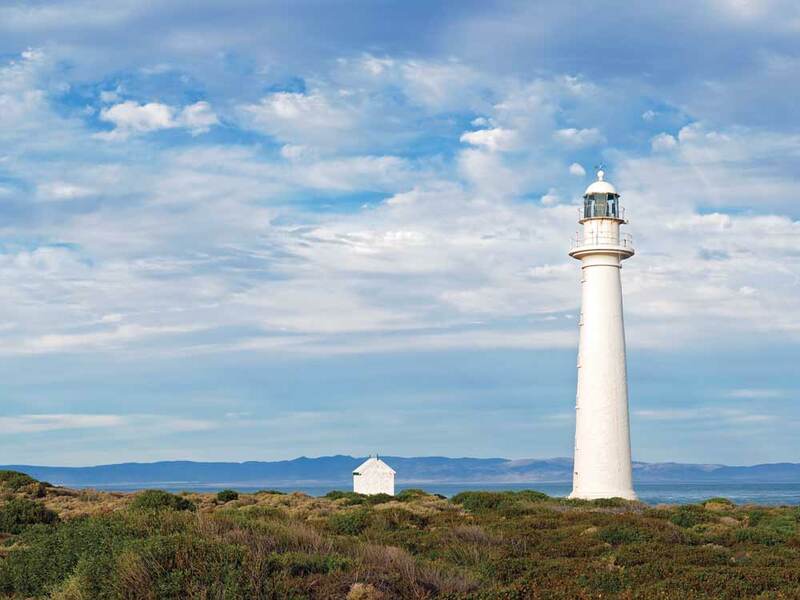 But while it remains an important industrial hub on this remote patch of South Australian coastline, the region’s natural wonders are also driving a burgeoning tourism industry. It’s the colours of the outback and that turquoise sea which are attracting the growing number of visitors. 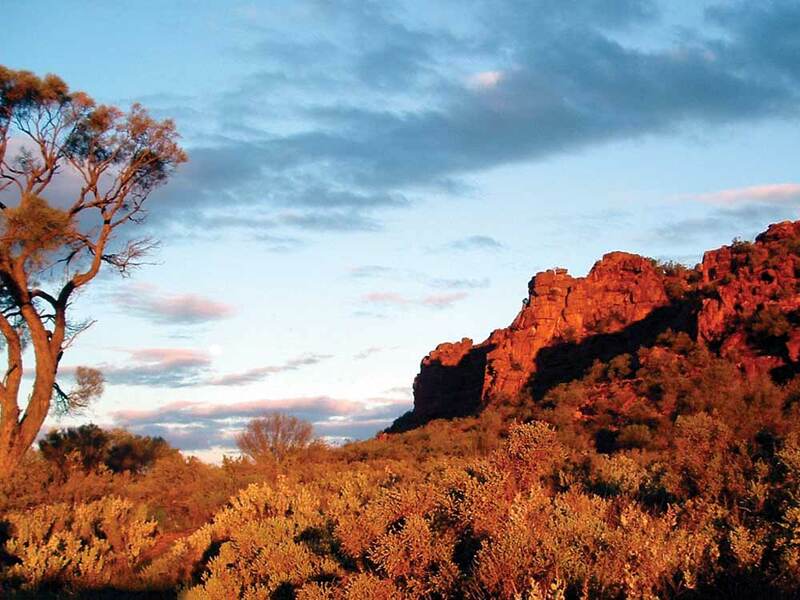 Throughout Whyalla and along the coast is a range of self-guided hiking trails. Lengths vary, but there are plenty of vantage points from which to watch the sun set. The self-guided 1.9-kilometre City Walk, which starts at the north-eastern end of the city, covers many of the local historical sites and also takes in Hummock Hill, a 10-minute climb for panoramic views of Spencer Gulf, the Flinders Ranges and the city itself. Signs along the trail explain the history of the settlement, industrial history, and natural and maritime heritage. In the centre of Whyalla, the 2.1-kilometre Education and Cultural Trail takes in the campus of the University of South Australia, TAFE South Australia, the Leisure Centre, Regional Development Australia and Middleback Art Centre. Signs along the route deliver facts regarding the buildings and other points of cultural interest. the conservation area’s flora and fauna. For more serious hikers, the Freycinet Trail hugs the Spencer Gulf coastline from Fitzgerald Bay to Point Lowly. The trail is 12 kilometres long and divided into two sections: the 4-kilometre Fitzgerald Bay Hiking Trail and the 8-kilometre Fitzgerald Bay-Point Lowly hiking, cycling and driving trail. The first section runs through dunes, pebble beaches and bushland before joining the joint-use trail which follows the coastal emergency track, with great photo opportunities. Interpretive signs explain the Aboriginal history, European exploration, flora and fauna, and marine life. 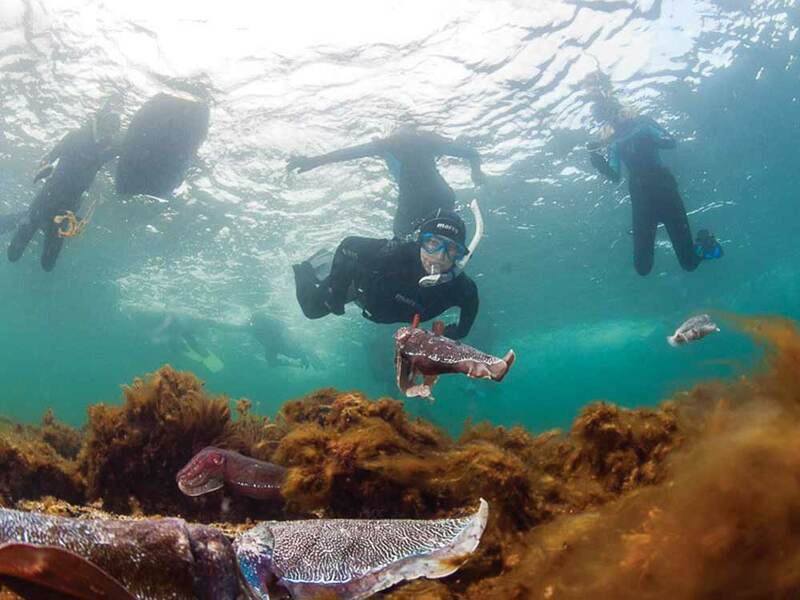 In the winter months, scuba-divers and underwater photographers come to Whyalla in droves to see Spencer Gulf’s famous aggregation of giant cuttlefish. In the summer months, it’s just a great destination for a seaside holiday. Giant cuttlefish aggregate to mate in the Upper Spencer Marine Park in the hundreds of thousands, an incredible spectacle to watch while scuba-diving or even snorkelling in the shallows, with much of the action taking place at three to seven metres depth. Safe swimming on the shallow foreshore at Whyalla Beach make it a good choice for young families, while the calm waters in the bay are ideal for kayaks and stand-up paddleboards, while close encounters with marine life are part of the attraction. When kayaking you’re likely to encounter a large pod of dolphins which visits frequently, following the fishermen in hopes of a snack, and a short distance along the coast a colony of seals have taken up residence on the Santos jetty. If you don’t want to get your feet wet, the Whyalla Maritime Museum is well worth a visit. It’s home to HMAS Whyalla, the first ship built in the Whyalla Shipyards in 1941, and houses a great collection of maritime memorabilia, taking in Whyalla’s shipbuilding era – plus there’s an excellent natural history gallery showcasing Spencer Gulf’s diverse marine environment. Twenty kilometres from Whyalla, a patch of coastline in Fitzgerald Bay with striking red shingle beach ridges is being considered for heritage listing. It’s one of only three places on the planet with similar shingle ridges, the other two in Scotland and Egypt. A geological phenomenon, the Whyalla stranded shingle beach deposits cover a distance of some 50 kilometres from the head of Spencer Gulf south along its western shore to Stony Point, and are believed to date back to the Pleistocene period. 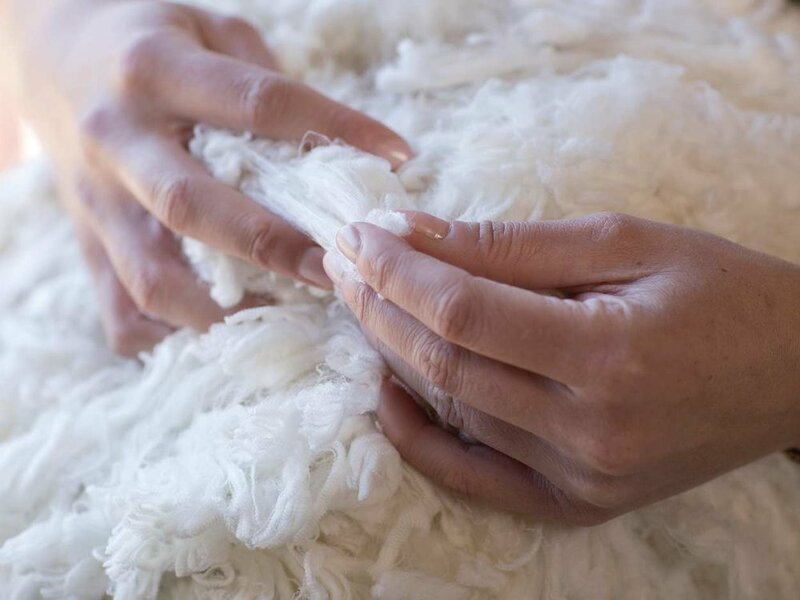 A two-minute drive inland from the city foreshore, Whyalla Wetlands is another popular spot for nature lovers. The wetlands area, created in the city’s old aerodrome, covers an area of 24 hectares, with almost seven hectares of artificial lakes to attract around 80 species of bird. Meanwhile, at nearby Hummock Hill in the Whyalla Conservation Park, you’ll likely spot red and grey kangaroos as well as more than 20 species of reptile.